Judging by the ingredients, many of you will expect today’s Potato Korma recipe to be tasty. Yes, I am confident about your positive reaction to this aloo korma. I did blog a recipe for Aloo Korma earlier but today’s recipe is a slight variation. Just an addition of few more ingredients to the original korma recipe, changes the flavor profile tremendously. The clean flavors of the vegetarian korma makes it an immensely satisfying side with flavored rice like biryani, pulao, roti or chapati. Fresh coconut, poppy seeds and cashew nuts are the key ingredients which elevate the flavors of the potato korma by leaps and bounds. 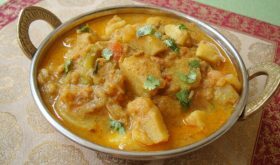 Do not omit or skimp on these three ingredients if you want to taste the authentic aloo korma. Heat oil in a vessel, add the chopped onions and curry leaves and saute for 4 mts or till the onions turn transparent. Add ginger garlic paste and saute for 3 mts. Add the chilli pwd, turmeric pwd, coriander pwd and salt. Combine well. Add the quartered tomatoes and partially boiled and cubed potatoes and cook on medium heat for 5 mts. Reduce heat, add the ground paste and garam masala powder and combine. Add one and a half cups of water, adjust salt and cook covered on medium flame for 7-8 mts. Remove lid and simmer till you get the desired gravy consistency. Garnish with fresh coriander leaves and serve with hot rotis, coconut rice or any flavored rice. You can add store bought tomato puree (1/4 cup) if you do not have fresh tomatoes. Poppy seeds can be omitted if not available. By Sailu Published: April 22, 2012 Potato korma recipe is an easy to make Andhra style recipe using spices like fennel seeds and fresh coconut. 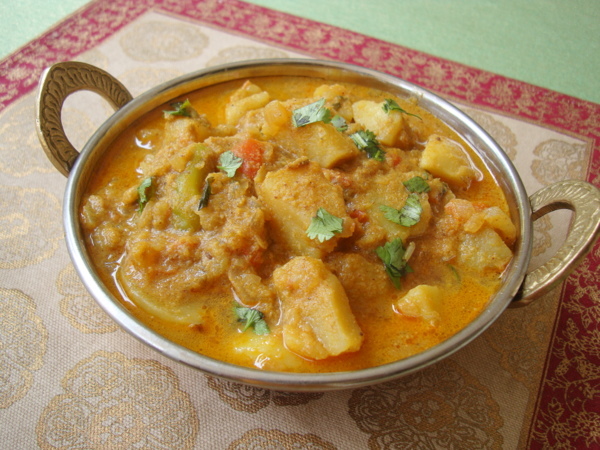 Aloo korma goes well with rice and rotis. Wow so tempting.. need some pulao now.. This looks so tasty. I can’t wait to make it. Soak the poppy seeds in few tbsps of milk for a few mts and grind to a paste. I was thinking of making this very thing.. thank you for the recipe… just in time!!! So many recipes to try! Thanks! I love pinning things to pinterest so I can go back and find the recipes! Tried this today. Fennel seeds were not in stock. so skipped that. However, we liked the taste. Made puris to accompany that. Thanks. Thank you, this was delicious! made a pilau to go with it. Very Yummy and delicious. tried with Dosa and was great. Thankyou very much for a wonderful recipe. OMG! i just loved the way ur posting. I cooked this curry today it was yummy my husband loved it no words just a big WOW…. It’s very tasty. I am pregnant and thoroughly enjoyed it . Loved your cabbage fry too. Thank You..
tried today and it cameout very well..Thankyou for sharing this recipe. I like this kurma from childhood. Love your recipe! Today I made this curry and it cane exceptionally tasty! This is the first time I made korma curry and poppy seeds and coconut are the main ingredients of it. Thanks for sharing the recipe!! Can I use coconut milk instead of fresh grated coconut.